Cheesy, creamy and delicious Apple and Cheddar Cheese Soup made with tart apples and shredded cheddar cheese. If you’ve been around these parts for just a few weeks, you have noticed that I’m pretty much obsessed with these two lovelies. Then again, how can you go wrong with Apple Rings and Chocolate Pumpkin Peanut Butter Cups!! You just can’t. My apple recipes have all been inspired by my apple tree. It’s huge. It’s beautiful. And IT.IS.FULL! Well, it was full … now it’s on its last few apples and those are about to come down because of the first frost that we had last night. Blah. Can’t buhlieve we’re that much closer to winter. GAH! Anyways! … okay, now that I think about it, this weather-thing ain’t that bad… before you know it, we will be knee-deep in peppermint and chocolate! YAY! But, for now, it’s about the apples. (I’m still thinking about peppermint and chocolate) … focussss! Apples. I asked my Facebook followers what apple recipe they would like to see first and the vote for soup won by a landslide! 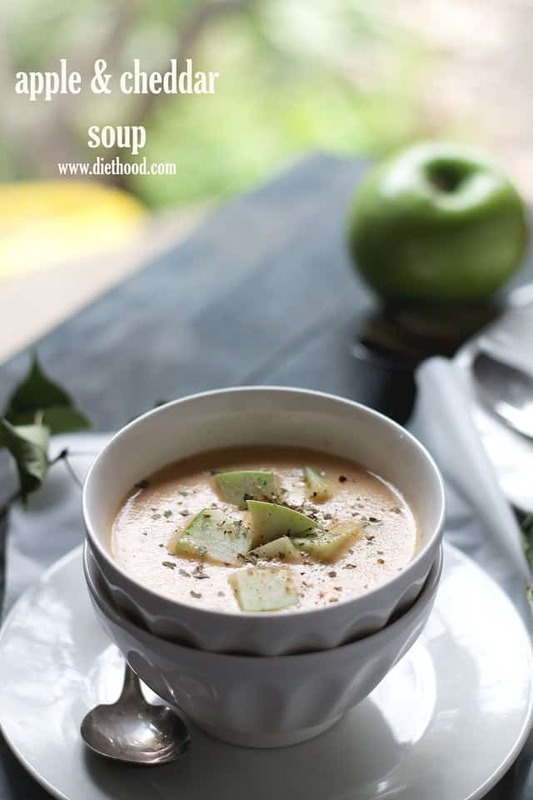 Have you ever had apples in soup? The first time I tasted apples in soup, I was at this little French Bistro called Bon Femme Cafe. It was small, it was dark, and very colorful. I loved it! Playing 1920’s jazz made me love it that much more! I used to frequent that place with my friends and the whole apples-in-soup just stuck with me. I don’t have their recipe, nor is this soup anywhere near their version, but I love it. In fact, I love it more! As far as I see it, if it comes straight from your own kitchen, it will always taste better because of one extra ingredient – love! I sound like Marie from Everybody Loves Raymond, but that’s the truth… you agree, right?! Cheesy, creamy and delicious Apple and Cheddar Soup made with tart apples and shredded cheddar cheese. Add onion and carrot; cook over medium-low heat for 7 to 8 minutes, or until vegetables are tender. Stir in flour and chili powder. Slowly add broth and continue to stir until everything is well combined. Add apple to soup and cover. Reduce heat to a simmer and continue to cook for about 10 minutes, or until soup is thick and apples are tender. Stir occasionally. Slowly stir in apple juice and shredded cheddar cheese. Continue to cook and stir until cheese is completely melted. 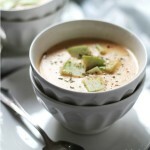 Ladle soup into bowls and garnish with diced apple. 10 Hearty Soup Recipes | Home. Made. Interest. Finally got around to trying this. During a sudden cold snap when it felt like Boulder was having second thoughts about this whole “spring” thing, it was heaven in a cup. Because I was too much in a hurry to shop for ingredients beyond the cheddar cheese, I did it with some odd substitutions. Didn’t have: Green apples. Used: A braeburn that was somewhat past its crispness date. Didn’t have: Carrots. Used: A turnip. Didn’t have: Veggie broth. Used: “Better Than Bouillon” mushroom variety. Didn’t have: Apple juice. Used: Pyramid Apricot Ale. I love recipes that forgive weird substitutions. This is definitely one of them. this sounds amazing, perfect warmer for this time of year! Thanks SO much, Giovanna!! 🙂 I hope you will enjoy it as much as we do! This is going on our soup rotation! Yum. oooh, Kate! I picked up some Apple Harvest Cheddar at Costco that would be perfect in this. Thanks! This soup looks so comforting! And um, you have an apple tree?! Jealous! We were definitely craving some of the same flavors last week. I posted a similar soup with butternut squash, apples, and chese. 🙂 Now I want to try yours. I looks delicious and I know that I would absolutely love it! Great recipe! Oh how absolutely lucky to have an apple tree!!! I love baking with apples but I don’t cook with them often enough. 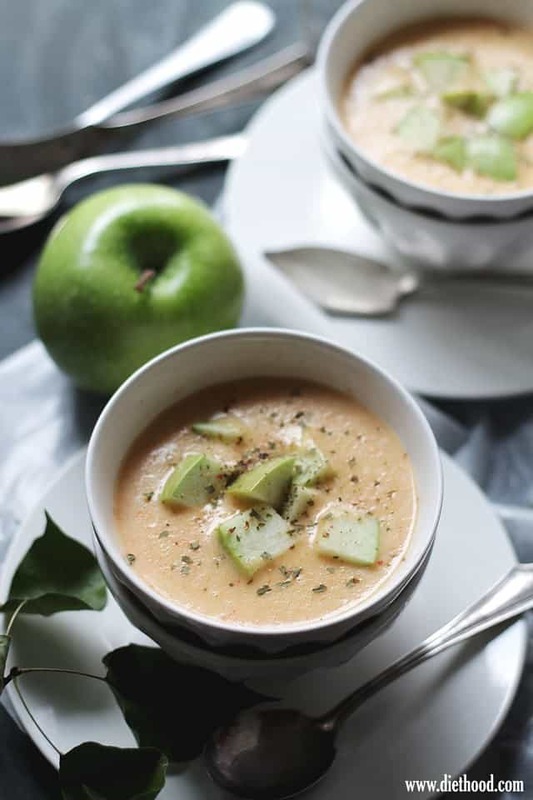 I love the flavors in this soup and apples and cheddar are perfect! Pinned and bookmarked this! Gorgeous soup, hon. Perfect for this time of year! This looks absolutely delicious! Looks hearty and so creamy…love it! very interesting. Never thought of the combination of flavors. Looks mighty good. Please don’t mention the word ‘winter,’ not yet anyway. I’d much rather think about this cosy, delicious soup! However, it seems like cheese and fruit bond great combo! Wow! Apples in soup! I never would of thought! Your fans have great ideas! This soup sounds great! Love a sweet and savory recipe! We had our first frost too. Boo! I want summer back. I’m so intrigued-I never heard of blending apples into a soup before! Who would’ve thought apple and cheese would go so well together?! I’m so envious of your apple tree, lucky girl! 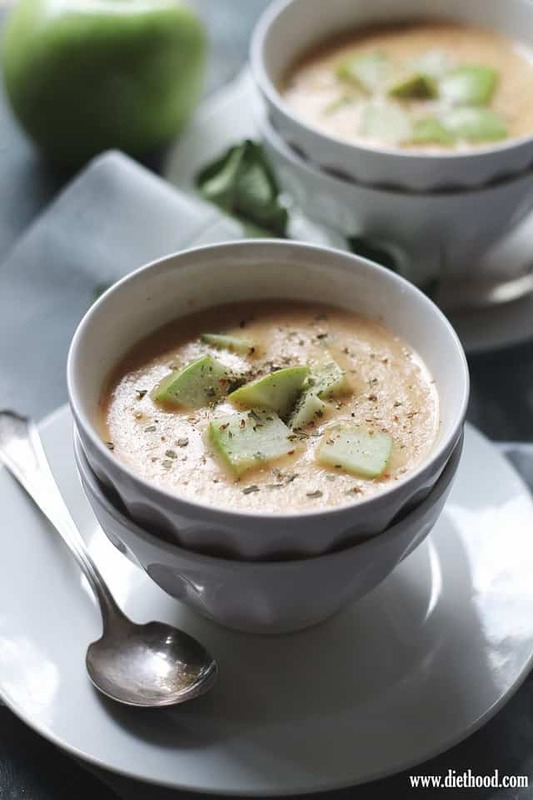 This soup looks so comforting and creamy good, love the apple & cheese combo!